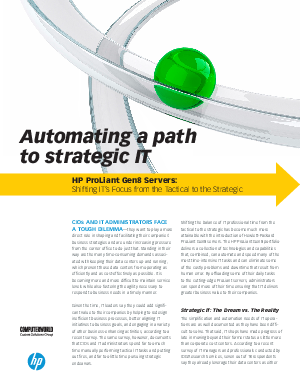 Shifting the balance of IT professional time from the tactical to the strategic has become much more attainable with the introduction of Hewlett-Packard ProLiant Gen8 servers. These HP servers deliver a collection of technologies and capabilities that, combined, can automate and speed many of the most time-intensive IT tasks and can eliminate some of the costly problems and downtime that result from human error. By offloading some of their daily tasks to the cutting-edge ProLiant servers, administrators can spend more time ensuring that IT delivers greater business value to their company or organization.